How do you price your software? Is it art, science or magic? How much attention should you pay to your competitors? 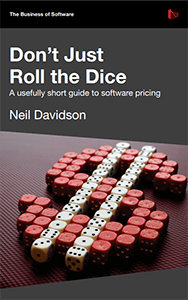 This short handbook will provide you with the theory, practical advice and case studies you need to stop yourself from reaching for the dice. Chapter 02: Pricing Psychology: What is your product worth? “At Business of Software 2007 Michael Pryor held an impromptu session on how to price your software. So many people turned up, and so many people kept on arriving, that by the time they’d introduced themselves there was no time left to talk about software pricing. I’ve had similar experiences; in fact, ‘How do I price my software?’ is probably the most common question I’m asked by software entrepreneurs and product managers. “This handbook is an attempt to answer that question.” Neil Davidson, Author. Neil Davidson is co-founder of Red Gate Software. Redgate was founded in 1999 and now employs some 275 people. It was Cambridge News business of the year in 2006 and has been in the Sunday Times top 100 companies to work for seven years running. It was founded with no VC money and little debt. Neil is also founder of the annual Business of Software conference and runs the Business of Software social network.